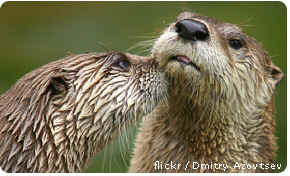 Tell your Senator to vote NO on any dirty water amendments to the 'minibus' bill, and to reject amendments on any other bills that would prevent the administration from restoring clean water protections for our wetlands, lakes, and streams AND that would allow polluters to contaminate rivers, streams and wetlands that provide habitats for river otters and drinking water for millions of Americans. I write to urge you to reject any dirty-water amendments to the minibus spending bill that would prevent the Obama Administration from completing a rulemaking to restore protections to streams and wetlands. The rulemaking would clarify which "Waters of the United States" are protected under the Clean Water Act in a manner that is consistent with both the law and the science. Without a rulemaking to restore Clean Water Act protections, not only are fish and wildlife at risk, but the health of Americans: the EPA estimates that more than 117 million Americans get their drinking water from public supplies fed in whole or in part by intermittent or ephemeral streams vulnerable to pollution under these decisions. I urge the Senate to simply allow the administration to move forward on this important rulemaking by voting NO on any dirty water amendments to the 'minibus' bill, and to reject amendments on any other bills that would prevent the administration from restoring clean water protections for our wetlands, lakes, and streams.